When it first launched in 2013, Spokane Restaurant Week truly broadened palates and minds about what Spokane and surrounding Eastern Washington restaurants had to offer. The following year it expanded to include North Idaho, namely Coeur d'Alene and Post Falls, and changed its name to Inlander Restaurant Week to represent neither city nor state; ours is a regional — and growing — culinary culture. Restaurateurs Viljo and Autumn Basso have been longtime supporters of Restaurant Week and although they participated with Syringa Japanese Café and Sushi Bar in the past, they found the event to be a better fit for their midtown Bluebird, says Autumn. Seafood is a definite theme for the Bluebird's three-course offering: seasonal scallops and octopus appetizers, northwest bouillabaisse and Chilean sea bass entrees, as well as a southwestern braised pork shank. The Coeur d'Alene Casino Resort and Hotel is offering three restaurants and two price points this year, and if the weather turns bad, there's the added bonus of their readily available hotel rooms. Both Sweetgrass Café and Red Tail Bar and Grill ($21) offer a casual dining atmosphere with a range of menu options for Restaurant Week. Try the tender beef tips or cheddar and chive chicken at Sweetgrass, and executive chef Steven Walk and his team's take on fry bread at Red Tail for either an appetizer or dessert with huckleberry syrup. Additional Native-inspired dishes include the Nisqually smoked salmon chowder and elk burger at Chinook Steak, Pasta and Spirits ($31), which is also offering crispy duck-breast and pan-seared perch entrée choices. Coeur d'Alene's Riverstone area is well-represented this year, with four participating venues, including newcomer Martino Tuscan Grill with an appropriately themed Italian menu offering that includes pan-fried calamari, gnocchi, and tiramisu ($31). Nearby, try the arepas or grilled corn fritters with queso fresco and black beans for one of your appetizer choices at Bardenay Restaurant and Distillery, which has a fig and balsamic pork tenderloin as an entrée option ($21). Anthony's is participating with both its Spokane and Coeur d'Alene restaurants, where seafood is what's for dinner ($31), including wild Patagonia shrimp marinara with caramelized garlic over pasta. And Brazilian-style food is on the menu at Grille from Ipanema, such as Sopa de Fejao com Calabreza or black bean soup with sausage, or Pastel de Palmito, which is pot stickers filled with hearts of palm, both appetizers ($31). There is no way to go hungry if you select their Full Churrasco Experience for your entrée: in addition to their all-you-care-to-eat salad and hot dish bar, servers arrive at your table with mesquite-fired grilled meats of all kinds for you to try. Although Restaurant Week has yet to extend to Sandpoint, that isn't stopping Sandpoint-based owners of Sweet Lou's Restaurant and Bar to participate with their Coeur d'Alene location across from McEuen Park. 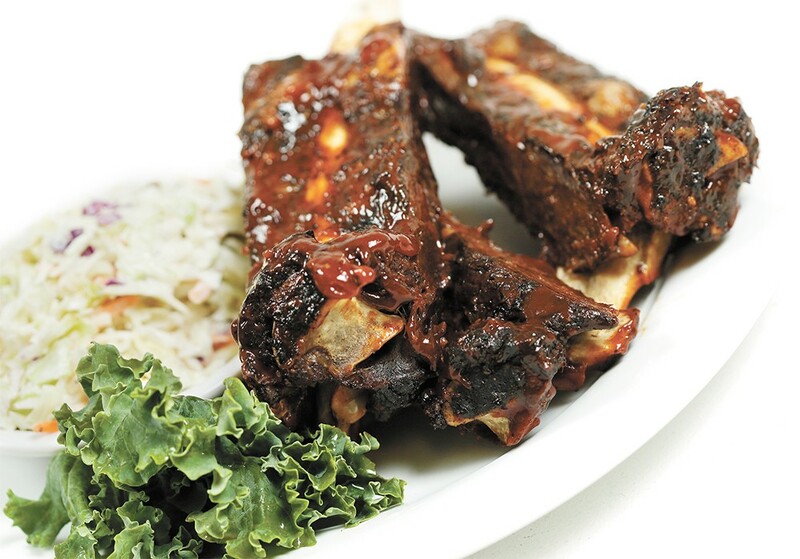 Try Sweet Lou's signature bourbon-glazed bison ribs, beef and bacon meatloaf, or Manny's Pale Ale battered fish and chips, as well as their trademark tableside S'mores or decadent skillet cookie with vanilla ice cream ($21). "It was a great way to introduce ourselves to the community and give guests an idea of what they can expect when they dine with us," says Sweet Lou's Meggie Foust. "We really enjoyed participating as a restaurant and we also made time to participate as diners. We went out as a family several times and treated ourselves to perfectly portioned three course meals without breaking the bank or our waistbands." The original print version of this article was headlined "A Taste of the Gem State"